This entertaining, wipe-clean introduction to grammar and punctuation for young children is the perfect way to start learning about capital letters, punctuation and writing simple sentences. 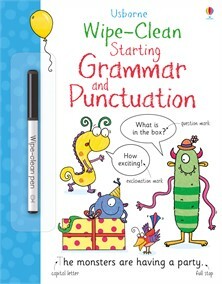 Great for practising pen control, and the wipe-clean pages mean children can practise their new skills again and again. Children can practise their letters with these free downloadable activity sheets.